Whether you are moving into a new place, remodeling your home, or just looking to add new items to your home, where you go to buy furniture can make a difference between a comfortable and cozy home and a sketchy shack. Compared to buying new furniture, buying used furniture can not only save you money, but it also has plenty of other benefits. To make the shopping experience more simple and hassle-free we put together a list of helpful tips for buying used or pre-owned furniture. When people are on a budget and are looking for used furniture, they often turn to Craigslist, local garage sales, and classified advertisements in the newspaper in an attempt to find discounted furniture pieces. While these sources are great for saving some bucks, the quality is not always worthy of purchase. Instead of buying furniture from these sources, there are alternative places where you can find high-quality, used furniture that is in good condition, such as consignment furniture stores. 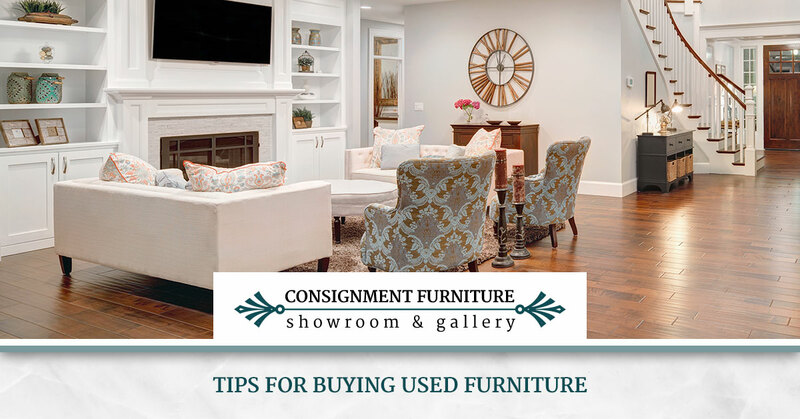 Many consignment stores carry a wide selection of furniture for just about every room in your home, including the kitchen, bedroom, living room, and more! Sometimes it’s fun to find old pieces of furniture and turn them into something new with your own hands! If you can look past an interesting piece of furniture’s stains, rips, and other flaws you can customize a gorgeous antique to your own customized style and taste with just a little work. If you aren’t sure how to reupholster or repurpose furniture items, there are plenty of helpful resources available online that be used to refurbish used or old furniture. There’s nothing worse than finding a great piece of furniture for your home, only to realize it will not fit. Instead of going through the trouble and hassle, be sure to measure the available space in your home before purchasing furniture to fill it. It’s not enough to just imagine the space — you have to measure it too to ensure accuracy. It doesn’t matter whether you purchase secondhand furniture on an online marketplace, a garage sale, or at a furniture store, you should always test it out before purchasing it. Open up drawers in cabinets, sit on couches and chairs, and lean on tables. If an item has been damaged, be sure to confirm that it is still in satisfactory shape for to you to start using at your home. Even if it is damaged, make sure that it is able to be fixed before buying it. When shopping for used furniture, it’s important to be mindful of the price of times, any damages or flaws, what you can fix, how much it will cost, and what you really can’t fix. It doesn’t make much sense to purchase used furniture that you cannot afford to fix, keep, or use. However, some fixes are fairly simple and do not require much money or effort. But, if parts of the furniture are completely missing, the price is set too high, or you’re not really ready for a total overhaul, it’s probably not worth your time, space, or money. Following these tips when shopping for used furniture should make the selection and buying process much easier. Instead of wasting time trying to find quality furniture pieces at the right price, just head to Consignment Furniture Showroom and Gallery! We have a large inventory of factory closeouts and gently-used furniture perfect for your home. To view our furniture pieces currently available, check out our online inventory.